Sweet, summery and utterly girly, our range of pink ear piercing studs makes it easy to update your look and put a little spring in your step. These pink studs come in a huge choice of designs, from sweet and sugary to cute and punky. Whether you’re a girly girl, a tomboy or not a girl at all, these ear piercing studs are a great choice for summer. Many of us are guilty of buying cheap earrings but it’s important to treat your ear piercings to quality jewellery. Cheap studs can irritate your ears and they contribute to sagging ear piercings. Our ear studs, on the other hand, are made of high quality body jewellery materials such as surgical steel, titanium and BioFlex. They combine excellent quality and biocompatibility with cute designs that you will love to wear. 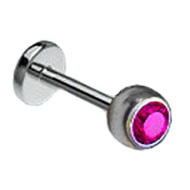 These ear piercing studs feature solid silver motifs on high quality surgical steel posts. They give you the beautiful shine of silver with the comfort of a steel post. We have over fifteen different silver and steel ear piercing studs to choose from – simply click on any of the images and scroll down to see the full range. 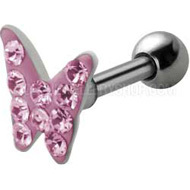 They can be worn in almost any ear piercing including ear lobe, helix and tragus piercings. Simple and stylish, these ear studs are a great gift for yourself. 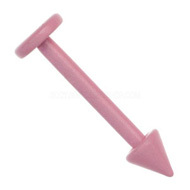 Did you know that you can also wear any labret stud as an earring? We have an enormous range of labrets and they make wonderful ear studs. Their flat backs are very comfortable to wear and they come in a great choice of designs. Below are three of our favourite designs. 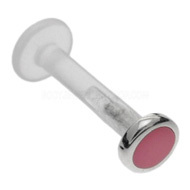 On the right is a BioFlex stem labret stud – this is an excellent choice for ear piercings that often feel sore or get irritated after wearing cheap earrings. BioFlex is non-irritating and reduces piercing healing times, so it gives your ears a change to recover from soreness and irritation. This entry was posted in Ear Studs and Earrings and tagged ear piercing, Ear Piercing Earrings, Ear Piercing Jewellery, Ear Piercing Studs, Ear Piercings on June 14, 2013 by Piercing Guru.